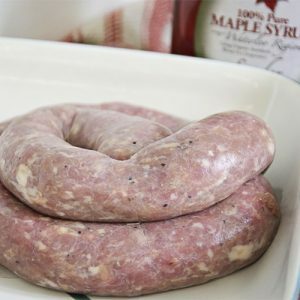 Maple Garlic Turkey Sausage - Hilltop Acres Poultry Products Inc. Maple garlic turkey sausage by Hilltop Acres Poultry Products Inc. are from local farmers to provide delicious, all-natural products. Note: The price shown for maple garlic turkey sausage is per pound. 10 minutes of prep 30-35 minutes cooking time. This recipe is great for breakfast, lunch, Dinner or cut into 1″ pieces and served with plum sauce during the “BIG GAME”! Directions: Twist sausage make 4 even length links. In a medium sized frying pan put 1/2 an inch of water. Bring to a boil. Place sausage in boiling water and cook on med high for 15 minutes or until cooked, turning half way. Roll out puff pastry into four 6 x 12 inch rectangles. Roll each sausage up and place on cooking sheet. Wisk egg white andmaple syrup together. 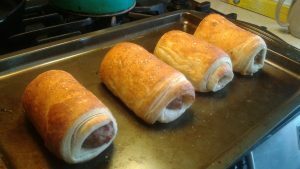 Glaze each sausage roll with mixture. Bake in a preheated oven of 400 degrees for 15-20 minutes or until golden brown. Drizzle with maple syrup and serve warm.